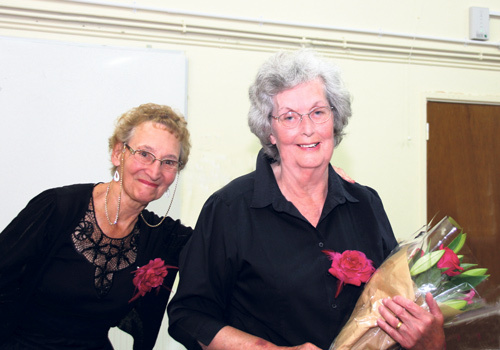 TWO long standing singers retired at the end of the Cleeve Singers Summer Concert and were presented with bouquets by Merle Hosking, Vice Chairman of Downend Folk House Association. Brenda Payton originally in a Fishponds choir, automatically became a member of Cleeve when two choirs amalgamated nearly 30 years ago but she has decided to give her vocal cords a rest and look after her husband who is not in the best of health. Jenny Trevatt is leaving after 29 years with the choir to live in the Forest of Dean. They have been staunch members and will be missed. The Cleeve Singers Concert on July 9 was well supported with varied music which ranged from Bond to George Shearings arrangements to words by William Shakespeare and Ivor Novello. The choir is under the baton of Jonathan Edwardes and accompanist Sharon Edwardes, a younger duo. No two concerts are the same; which shows how hard the choir have to work. Anyone interested in joining this friendly happy choir should contact the Secretary, on 0117 9561881 or via Lincombe Barn. All four sections now have vacancies. Despite enrolling quite a few singers over the last couple of seasons, retirements are keeping pace with the intakes.